It is fairly obvious the direction home prices will soon be taking with 40 months of shadow inventory ready to enter the supply stream, unemployment continuing to surge, and our depression moving into the next leg down. 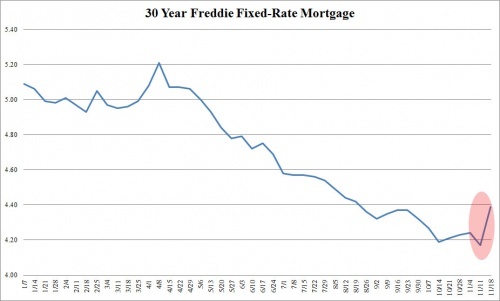 But what if the artificially government suppressed mortgage rates were to actually start rising? The chart below shows this past week's move in rates.